A cartulary is a collection of loose charters (documents) copied in book form, both to make them easier to consult, and as a 'backup' in the case the originals get lost or damaged. Usually they contains records of properties and rights (rather than minor transactions), and are commonly arranged chronologically if they refer to rights, or geographically if they refer to property. This manuscript contains copies of about 36 royal and other charters granted to the Benedictine nunnery of Wilton, in Wiltshire. The text of a charter usually follows a set pattern and has standard wording, except for features such as place names, personal names, and dates. Sometimes these crucial parts of the document are emphasised to make them easier to find among all the other text. 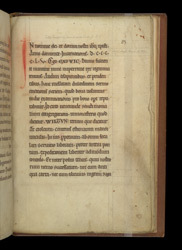 In this example the date 945 (d.c.c.c.c.l.v.) is written is spread-out letters, and the name of the grantor, Eadwig (EADWIC) and place, Wilton (WILTUN) are written in capitals.